The Glycemic Research Institute documents four areas analyzed when determining GI. These areas include increase in blood glucose levels, amount of insulin secreted, stimulation of Lipoprotein Lipase (LPL) and fat-storage mechanisms, and pancreatic effects. Foods can be ranked as low, medium, or high in accordance with their GI. Examples of foods containing low GI (55 or less) include oatmeal, sweet potato, corn, legumes, and non-starchy vegetables. Foods with medium GI (56-69) include whole wheat, rye, brown rice, and couscous. White breads, refined grains, potatoes, pretzels, and saltines are examples of high glycemic foods (70 or more). The American Diabetic Association (ADA) comments on the importance of portion control even when consuming low GI foods, “The GI value represents the type of carbohydrate in a food but says nothing about the amount of carbohydrate typically eaten. Portion sizes are still relevant for managing blood glucose and for losing or maintaining weight.” Meal plans that monitor GI and encourage portion control are important for healthy weight and normal blood glucose levels. It’s best to seek guidance from your healthcare practitioner when developing a nutrition plan. GI properties vary when various foods are consumed. 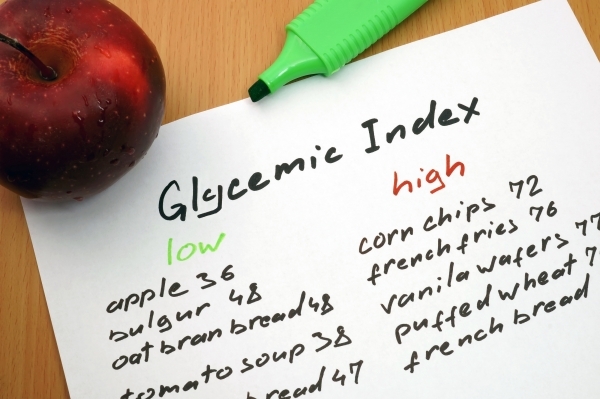 High glycemic foods may be combined with low glycemic foods to balance blood glucose levels. It’s key to mention low GI foods aren’t necessarily healthier than high GI foods. There are foods with high GI that contain nutritional properties when eaten in recommended portions. The ADA comments, “Many nutritious foods have a higher GI than foods with little nutritional value. For example, oatmeal has a higher GI than chocolate. Use of the GI needs to be balanced with basic nutrition principles of variety for healthful foods and moderation of foods with few nutrients.” GI provides a guide for clients seeking to maintain balanced blood glucose levels and healthy weight. Visit the ADA for more insights on GI.